"The Church Of The SubGenius is an order of Scoffers and Blasphemers, dedicated to Total Slack, delving into Mockery Science, Sadofuturistics, Megaphysics, Scatalography, Schizophreniatrics, Morealism, Sarcastrophy, Cynisacreligion, Apocolyptionomy, ESPectorationalism, Hypno-Pediatrics, Subliminalism, Satyriology, Disto-Utopianity, Sardonicology, Facetiouism, Ridiculophagy, and Miscellaneous Theology." Much of this is a parody of the new age terms and organised religion, a refuge for people who cannot be a part of the mainstream…. Ahem! The Church of SubGenius further is the only for-profit religious organisation that claims to be "Proud to pay its taxes", making people pay to become lifetime members! 🙂 One of funniest that I've seen is Monty Python's Life of Brian. 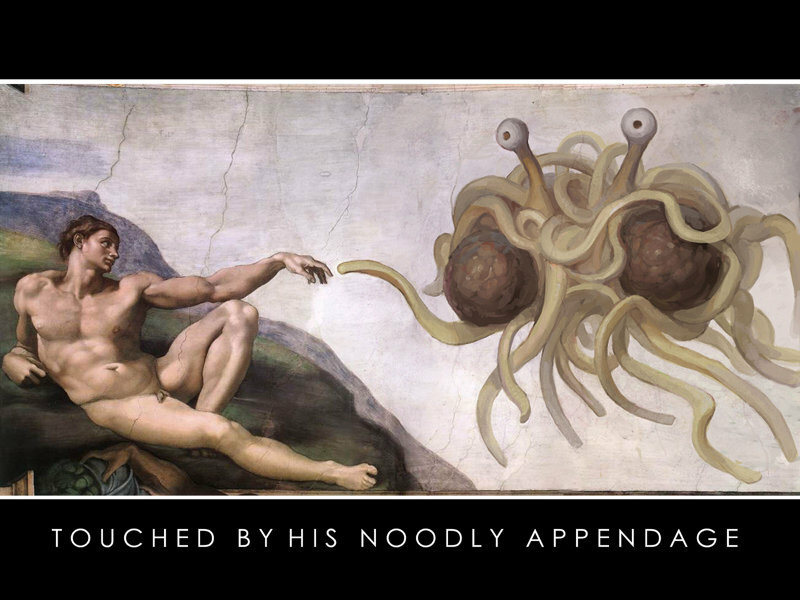 Then there is the Flying Spaghetti Monsterism, it is typically depicted as a clump of tangled spaghetti with two eyestalks, two meatballs, and many "noodly appendages," here in a parody of Michelangelo's The Creation of Adam, featured much on Boing Boing…. :D. This came at a time when George Bush was seriously considering offering 'intelligent design' as a companion course to evolution. Much like offering astrology as a science in India not so long ago….